The internet here is not a new thing in the least, but gaining access to it works a bit differently and, as anything else new and cutting edge, has yet to permeate the infrastructure to the degree it has elsewhere. In other words, Russia isn't as online as America is. When I was on my mission, I think I visited perhaps one apartment that had internet access and she didn't even live in my area. It's expensive and hard to wire a building here for internet access as all the apartment buildings in the city areas are essentially HUGE cinder blocks made out of slabs of solid concrete glued together with the tears of the proletariat. Many of the ISPs that have popped up since the turn of the century were evil capitalistic pigs who enjoyed taking advantage of this rare new "internets" along with the universal Russian attitude that laws are not so much rules to be followed as they are rules that should be ignored whenever it will be more profitable. The result has been that as rare as a home computer was, an accompanying home internet connection has been the proverbial Loch Ness Monster of Russian technological trends. This meant that the only people that could afford good internet connections were businesses solely devoted to providing the people with dirty, smoke-filled rooms stuffed with cursing teenagers who insist on trying to read the English you're typing over your shoulder while loudly asking you "HELLO-VAT-IZ-YOOR-NAYM?!" and these businessmen could only afford these connections because they charge you 46 dollars per megabyte that exists on the entire internet or one of your future children per hour you want to use a computer. Those of you who received my emails from my mission know to how high of a regard I hold these clubs. Now, however, things are changing. I've been looking around at connection options here in Moscow now that we have our own computers with us, and without bothering with the usual cable and dsl landlines, I'm still relatively impressed. First of all, all McDonald's restaurants, most mall food courts, and a lot of clubs have free wifi, no questions asked, no purchase required. Just walk in and connect up. Second, most cell providers here also sell little modems that connect to their cell network and, thereby, the internet for a price. 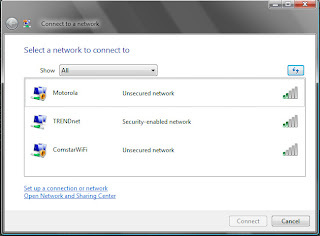 Third, a couple cell networks and some other private companies are slowly setting up a network of city-wide wifi access points that anyone can connect to, sign up for an account with, and pay for usage. You pay for this usage through general communication payment terminals that are literally everywhere where anyone on any cell or internet provider can go to pay their cellphone and/or internet bill (or add money to their pay-as-you-go cell or internet services). I don't know who owns these terminals or what, but they are in every cellphone kiosk, metro station, grocery store, corner market, or shopping mall. I've seen some just sitting there on the sidewalk. It'd be like if at every gas station in America some company installed touchscreen kiosks where you could pay for AT&T, Sprint, T-Mobile, Verizon, Comcast, Qwest, or whatever other service you have. It's kinda crazy. So if you have a computer, you have 40 billion options for connecting to the internet, especially if one of those wifi points are visible to your computer from your apartment. Beeline, a cell carrier here, has a wifi network that costs only 500 roubles a month for unlimited access which is about 3 or 4 cents or something (it's actually currently about $16). You just connect up, sign up for an account, go to a terminal, log in, and insert a 500 rouble note and you're good. As long as you can see a wifi spot, it couldn't be easier. Unfortunately, my computer can't see any of these commercial wifi spots from our apartment. At all. So what could I do? Give up? Giving up is for losers who give up a lot. Me? I didn't give up. I went to Ikea instead. 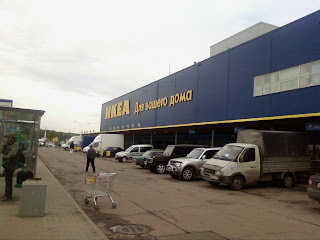 There are more than a couple Ikeas here in Moscow, and they fit right into the European landscape but for some reason still make me feel at home. This Ikea that we went to is the first place I've seen in the former Soviet Union that let's you self-serve soda right out of a soda fountain, and the only other place except McDonalds that I've even seen a soda fountain. It was magical. I also learned the Russian word for "meatball" which is pronounced "freak-a-del-ka" which is my new favorite Russian word and the future name for a future pet cat or something. I also bought a strainer. One of those parabolic metallic mesh ones. That Beeline point sometimes connects at 4 bars too. This is more than enough to email, upload pictures, call home on Skype, and all that junk. I was able to connect and sign up for a Beeline account before my arm started to LITERALLY FALL OFF and I had to put the strainer that I was holding up to the window down. Anyway, I'm sure I'll find something to attach the Parabolic Metallic-Mesh Kitchenware Antannae (PMMKA for short, which has a sufficient lack of vowels to be a real word in Russian) to so I don't have to hire a small child to hold it up for me, and we should have internet access at home pretty soon. This is good because then we can call home from our apartment instead of trying to hide in the McDonald's bathroom after they close in order to Skype it back to America. Maybe I'll use a lamp with an adjustable arm... Perhaps I'll go back to Ikea. This entry was posted on 9:20 AM and is filed under moscow . You can follow any responses to this entry through the RSS 2.0 feed. You can leave a response, or trackback from your own site. Worth, you are a giant among men. I salute you. A strainer? I have that strainer...I am inspired...in so many ways. Freak a del ka Batman! The boy is a wonder! "slabs of solid concrete glued together with the tears of the proletariat"
That one's a gem. I'm pretty sure I LOL'ed when I read it. ohh by the way i forgot can u please send it through my email about on how to use my beeline wifi card?This is my email add sherry211982@yahoo.com.thanks alot. My name is Kimberly Owens I was browsing internet and found your blog. The author did a great job. I will subscribe to your RSS feeds. Thank you for your contribution. I am a web designer myself. And here some examples of the websites that I designed for canadian payday loans loans company.